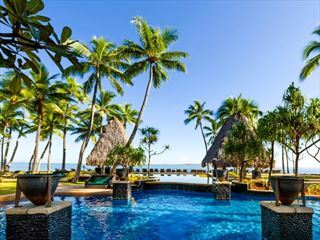 Perched along the golden sands of Momi Bay on Viti Levu, Fiji Marriott Resort Momi Bay is a tranquil oasis perfect for those hoping to escape modern stresses. 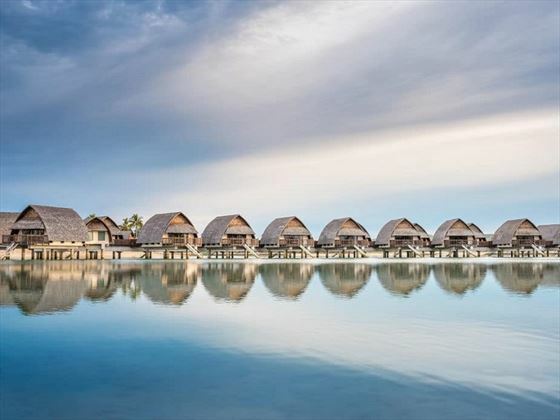 With gorgeous over-water villas, delicious restaurants and three pools, there’s something for everyone here. 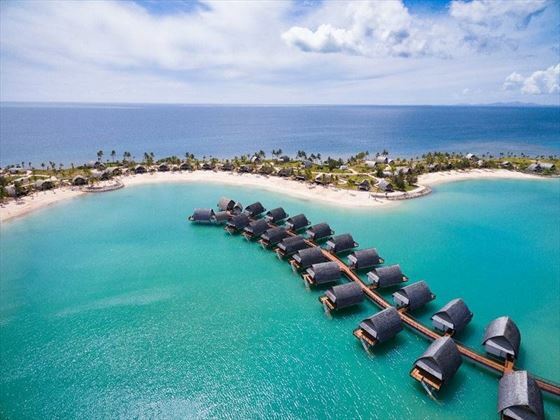 The over-water villas are, of course, the most indulgent choice, but the Lagoon and Oceanfront Bures are just as luxurious, with minimalist décor and close proximity to the crystal-clear waters. There is a range of water sports to enjoy, or you could enjoy a soothing spa treatment in the Quan Spa. No matter how you enjoy the day, there is a variety of fantastic restaurants and bars to chill out and enjoy a casual feast. Goji Kitchen & Bar offers a delicious insight into fresh, Fijian flavours, whilst Fish Bar’s sumptuous seafood is paired with delightful cocktails. 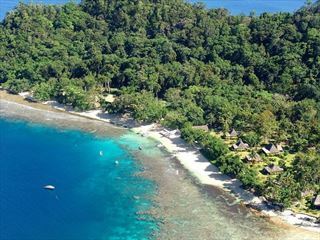 The resort is nestled on Momi Bay, a beautiful beach situated on the western coast of Viti Levu island. 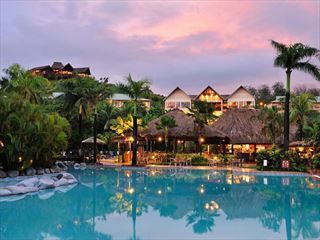 Deluxe Lagoon View Rooms – Standard 38sqm rooms with one king or two double beds, and lagoon views. Sleeps a maximum of three guests. Deluxe Lagoon Front – 38sqm rooms perched at the front of the lagoon, featuring lovely views and a small sitting area. Sleeps a maximum of two guests. 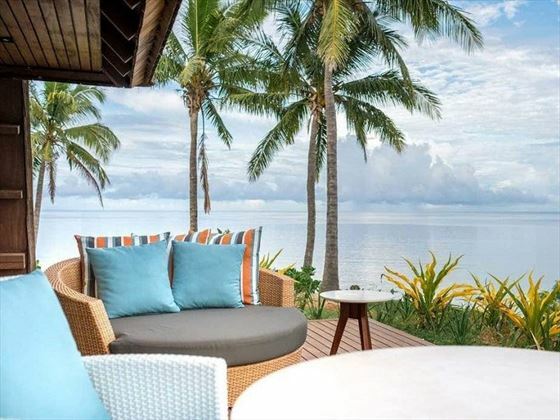 Duplex Lagoon Front Bure – A minimalist 42sqm bure located on the lagoon front, featuring a living area and pretty views from the glass doors leading out onto the balcony. Sleeps a maximum of three guests. Duplex Ocean Front Bure – Rustic 42sqm bures nestled on the ocean front, with a slightly larger living area, and sloping ceilings. Sleeps a maximum of three guests. Lagoon Bure – These gorgeous 60sqm bures are situated by the lagoon, featuring a cosy living space. Sleeps a maximum of three guests. 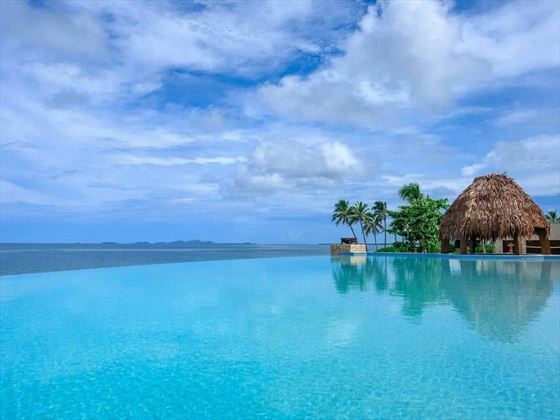 Ocean Front Bure – Modern 60sqm bures located on the ocean front, with a spacious living area. Sleeps a maximum of three guests. Royal Lagoon Bure – Gorgeous 75sqm bures sit by the lagoon, featuring a large living area. Sleeps a maximum of three guests. 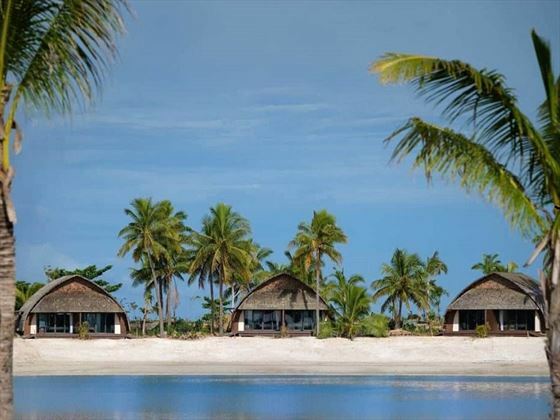 Royal Ocean Front Bure – Spacious 75sqm bures situated on the ocean front, with high ceilings and a welcoming living space. Sleeps a maximum of three guests. 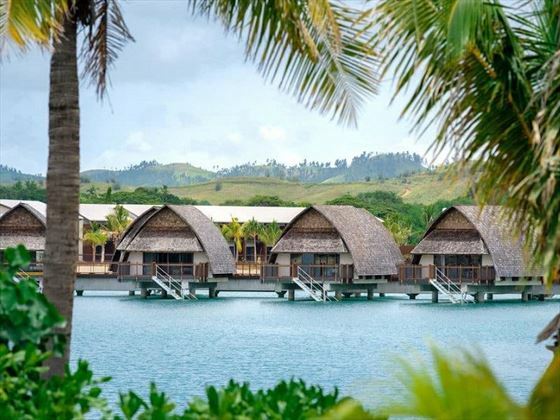 Over Water Lagoon Bure – Sitting on stilts above the lagoon waters, these 60sqm bures have easy access to the lagoon’s crystal clear waters, and a great living space. Sleeps a maximum of three guests. 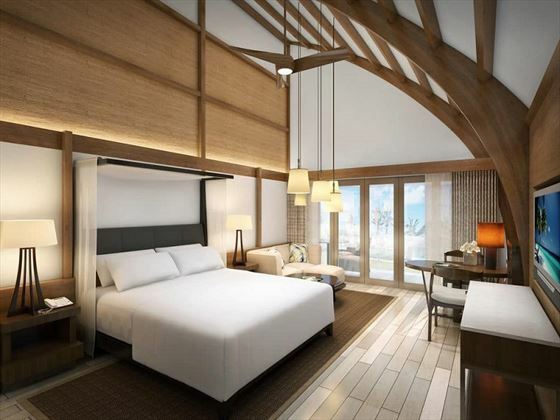 Over Water Royal Suite – Expansive 75sqm bures nestled on stilts over the lagoon, featuring a separate lounge area. Sleeps a maximum of three guests. 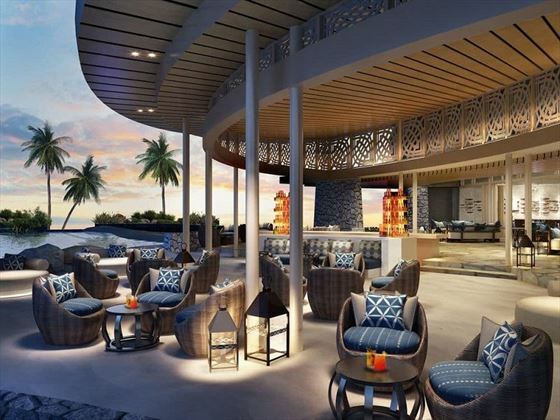 Lagoon Lounge – A vibrant spot to enjoy a sumptuous signature cocktail. Swim-Up Bar – A chilled out bar nestled in the main pool. Goji Kitchen & Bar – A contemporary and casual all-day-dining restaurant offering authentic, local Fijian flavours. Fish Bar – An elegant seafood grill pairing fresh fish with decadent cocktails for lunch and dinner. Lagoon House & Bar – A tranquil spot where you can relax in the large daybeds. Fiji Baking Company – A deli and bakery serving delicious, freshly baked patisseries and baked goods. Quan Spa – A calming spa offering relaxing treatments that will revitalise the mind, body and soul, plus a sauna and steam room.